For the record, I’m not buying a new iPad Pro, nor am I buying a new Apple Pencil. My current iPad Pro is still (as of today) the most recent version, and it is fine for the work that I do. As I mentioned in my last post, I just bought a new (refurbished) MacBook Pro, and I won’t even think of updating my iPad Pro until this device is paid for. The new iPad Pro is incredibly fast–it runs at speeds faster than my new MacBook Pro! It also loses the home button, the lightning port, and gains Face ID. I have no problems with any of these improvements–and they only align for an amazing upgrade in a year an a half (or sooner) when I buy my next iPad Pro. It’s hard to know when Apple is going to update hardware, so I can’t really guarantee that Apple will come out with the next iPad Pro in November 2019. It will be a “wait and see” situation. All I know is that I will eventually move to a new iPad model at a natural time in my own upgrade cycle that matches Apple’s upgrade cycle. The item that surprised me the most was the new Apple Pencil and its incompatibility with the old iPads–including the current 9.7″ iPad. Our school bought a bunch of the new iPads last summer as our new building houses about 300 additional students (this year). The old Apple Pencil and the Logitech Crayon work with that iPad (I just ordered two Logitech Crayons for my boys own 9.7″ iPads as a Christmas gift), but the new Apple Pencil will only work with the iPad Pro. I would have expected some kind of backwards compatibility with the new Pencil, considering the 9.7″ iPad. But things will go back to normal where the Pencil will only work with the new iPad Pro (that’s how it used to be). I’d actually like to see an owner be able to use a Pencil with all their devices, particularly their iPad and iPhone, as I have attempted to write on my iPhone many times. The issue, I believe, comes in charging. The iPad has a built-in inductive charger that charges the new Apple Pencil (no more lost end caps! ), and the iPad has added USB-C in place of the lightning port. This means the old way of charging wouldn’t work any more. So I think it’s the right move for Apple–USB-C, inductive charging, etc. I just hope Apple keeps the old Pencil around for schools for a little while, and that they update all of the devices to use and charge the Apple Pencil, too. If you’re in the market for a new iPad, I can’t recommend the new Apple iPad Pro and the new Apple Pencil enough. While I think I will always default to the 12.9″ iPad from this time out, the new 11″ iPad should be the equal to a sheet of paper. This would be a great time to buy an incredibly powerful machine, and it will be fun to see what developers do to take advantage of the new speed of these devices. New 13″ 2018 MacBook Pro on the left, old 13″ Aluminum MacBook on the right, migrating from one device to the other using Migration Assistant. After several years of debating the issue and putting it off, I am writing this post on my new 2018 MacBook Pro. This has been a long time coming, as my previous MacBook was purchased just over 10 years ago (October 2008), and I have not been able to update the operating system on that computer for three years. I might have continued to use my 2008 MacBook if Apple’s own programs would have worked on it, but last year’s updates to the “iWork” apps (Pages, Keynote, and Numbers) would no longer work on my old operating system. On the other hand, all of my other productivity software, including Finale 26 and Notion, worked just fine on my old MacBook. My old MacBook wasn’t in its original condition, however…I had upgraded it to the maximum of useable memory (4GB on that device) and to a 512GB SSD, because it was so slow. That solved the problem–but didn’t solve my issues with Apple’s own software, which I use a lot. So…what did I buy? A refurbished 13″ 2018 MacBook Pro, i5, 2.3GHz Quad Core with Touch Bar, 16GB of RAM, and a 512GB Hard Drive (I wouldn’t suggest buying a MacBook with anything less). I also bought the extended Apple Care+ warranty (there is an educator’s discount). I decided to go with the MacBook Pro versus the new MacBook Air because the new Air with the same memory configuration would have been $140 less, with a much slower processor (1.6GHz Dual Core) and no Touch Bar. So in the end, the speed and TouchBar won me over. I could have bought a i7 MacBook Pro, but didn’t want to spend any more on the computer (there are other things to buy). The stereo speakers are a little bit of a surprise, too. I just sent an e-mail message and was shocked to hear the message “wooosh” from one side of the computer to the other as it was sent. I guess there is no longer any Mac C-major start-up chime, either. I’ll also miss the “glowing apple” on the back of my 2008 MacBook. There is no CD-ROM drive, either. Other than DVDs, can’t remember the last time I loaded a CD, and I’m not buying music on CD, either. Actually, with Apple Music (family subscription), we’re not buying any music–just paying for streaming. I bought the Apple HDMI and VGA USB-C adapters, which will give me a traditional USB port (on each adapter). I like the future of USB-C. USB-C is coming on the new iPad Pros, and I think we’ll see it on all of Apple’s products soon. I won’t buy a new iPad Pro until this computer is paid off (interest free financing from Apple), so I have a double incentive to get this device paid off as soon as possible. So far, the TouchBar has been useful, and it is surprising to see my 2008 Aluminum MacBook in comparison. The devices are clearly related–but 10 years has definitely refined the device. I traveled through Europe with that computer in the summer of 2009, when we accompanied my high school’s Spanish teachers on a European trip. The MacBook has some dents and bruises, but it has kept working like a champ (even if I have replaced the hard drive various times for size and performance). I’m getting used to the new keyboard (new to me), which was redesigned for 2018. I might have considered a 2017 refurbished MacBook Pro, but there were a lot of keyboard problems (my friend and fellow music techie Robbie Burns has suffered through a number of repairs) and I wanted to avoid that model. I also bought the $199 Education Pro Apps Bundle with the computer…it’s going to take some time to figure out how to use the programs…but it is nice to have them. Apple’s migration assistant worked flawlessly. It took a LONG time…4 hours or so…but everything from my old MacBook seemed to come over…and all of my important files are backed up in my 2 TB of data with iCloud anyway. This is the first time I have migrated a Mac, whereas I have migrated many iPods, iPhones, and iPads over the past ten years. My wife and her parents recently updated their iPhone 7 models to the new iPhone XR, and Apple has really made the migration from device to device a very simple process. I’m impressed. While this isn’t a cheap purchase–it is a device that will be used a lot in the coming years–by me and by my family. My work flow may even change away from the iPad a little bit as I will have a reliable MacBook to work with (my old MacBook would occasionally power off for no good reason, even when plugged in). This will be my birthday (just a couple days away) and Christmas present…perhaps for a couple of years. And I have not bought any ukuleles for a couple months (that’s a record). I hope your school year is going well–mine has been enjoyable so far! It is hard to believe that we are in November already! As I mentioned in a previous post, when Apple announced the new iPad Pro (there is a 10″ version) they also announced the same updates to the 12.9″ model. I have been putting off the purchase of a new iPad for some time–and it was time to upgrade. This was facilitated with 0% financing from Apple for 18 months. That iPad arrived on Tuesday, and I have been using the iPad Pro in my daily life for the past three days. I have been reading a lot about the iPad Pro models on all of the technology news outlets. The general consensus is that the iPad Pro is wonderful, but it costs a lot. This sounds like typical Apple to me. That said, my 2008 MacBook (which I am still using) was pretty expensive ($1500 if memory serves), but it is still working for me nearly 9 years later. I have been integrating the iPad Pro into my life, and for the most part, what I have to say is this: it is a big iPad that does what iPads do. I am able to do some more split screen activities as the size better allows for it, and it is wonderful for reading music. I have now attended two ukulele functions with my iPad Pro, my PageFlip Dragonfly, and my AirTurn GoStand/Manos Mount. Music reading on a digital device doesn’t get any better (although I would recommend Michelle Mastin’s thoughts on using Samsung Chromebook Plus as a music reader...she prefers the Chromebook–which can run Android Apps–to a Windows Surface!). My iPad is used as a tool to run my class (everything is organized in Keynote), as well as a music reader. The primary reason that I wanted the 12.9″ iPad was to read music, so it is doing exactly what I want it to do. Did I need the latest version of the 12.9″ iPad to read music? No! I could buy a used model for that task. But when buying an iPad or iPhone, I do believe in buying the latest version so as to give it the longest possible shelf life. The pencil is a fantastic tool…I love it. I hope they make the iPhone a pencil-friendly device this fall. 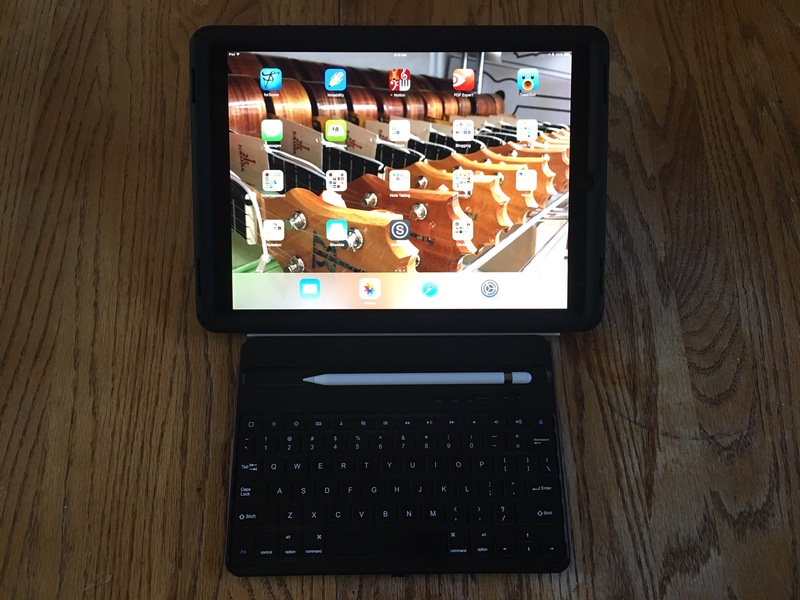 I don’t have an Apple keyboard…I just have the keyboard from a very inexpensive New Trent iPad case (previous model) that I use, and that works for what I need. My iPad/Tablet stand is from IKEA and cost $3. I will say that I have spent some time with drawing music into the iPad, and I am amazed at how well Notion’s handwriting works for a $7 in-app purchase. I don’t see handwriting as a great way to enter a lot of music into an iPad, but if you need to write something quickly and have an iPad Pro–and are not overly familiar with technology–handwriting is an amazing solution. The limitations of the 12.9″ are its size and weight…which aren’t really limitations. They are the reality of the device. The limitations of the iPad Pro are found in the operating system and the available apps. Don’t get me wrong…and iPad can do more things than a computer used to be able to do. Apple is addressing the operating system with new iPad features this fall; and chances are that apps will continue to develop as the operating system changes. I simply can’t do all of the steps to make these videos on an iPad. Currently, I cannot save a YouTube video from iOS (Even the Workflow App is broken in that regard), I cannot open that video as an audio file and make changes to it, and I cannot use the timeline to make a “Picture-In-Picture” bouncing ball icon to follow chords. In regards to the initial creation in Keynote, I cannot attach an audio recording to the entire document, record timings, and export as a video file. All that said, my new iPad Pro has a much faster processor and a much more advanced graphics processor than my old 2008 MacBook. It could handle everything that my MacBook could do…but the apps have to allow for it. Hopefully that will come! As for the speed on the iPad…the iPad Pro runs everything that I ran before at the same perceptible speed…so I wouldn’t upgrade for that reason. I would say that if you have an iPad older than the original iPad Air, it is probably time to upgrade. There are three new iPads…the $329 9.7″ iPad, the new 10″ iPad Pro, and the updated 12.9″ iPad. You really can’t go wrong with any of them. I was busy with school items today and did not catch the news from WWDC. I still need to watch the keynote (perhaps tomorrow), but Apple released a SIRI based speaker, and also introduced the newest versions of the iPad Pro (10″ and 12″ models). As I have said for a long time–I was waiting for the new version of the 12″ iPad Pro, and it has been ordered, and should arrive next week. I am looking forward to the new iPad for a number of reasons: Apple Pencil, increased speed, much better speakers–but most importantly, size. I am using reading glasses now on a daily basis (something my eye doctors said would eventually happen) and I am really looking forward to interacting with a 12.9″ screen. I am sure my next iPhone will also be the “Plus” size. I don’t buy every iteration of every Apple device. My MacBook (which I am working on right now) is a 2008 Aluminum MacBook (later rebranded as the 13″ Unibody MacBook Pro) that has had 3 hard drive upgrades and holds as much RAM as I could put in it (6GB). My iPhone is an iPhone 6S that will be two years old in September, and my iPad is an iPad Air 2, which is now over two years old. Even my Apple watch is going on two years! Depending on what my carrier does, I will likely upgrade to an iPhone 8 in the fall (or a 7S Plus…whatever it is called), and I will try to continue to use my MacBook as long as I can (9 years in October!). My Apple watch has been a critical element (along with my iPhone) in helping me with my health (more about that next week) and whether or not I upgrade that device depends on what the new devices will do, and what my older device can no longer do. This is true for most of my devices…when my MacBook can no longer run Finale, iMovie, or Notion, I will upgrade immediately. I already cannot upgrade the operating system. So I do have a lot of Apple stuff, but much of it has been purchased over time, and it is a hobby as much as a professional interest. I’ll be sure to write about the new iPad Pro when it arrives. There have been a number of posts recently about what you can do with an Apple Watch. I have had mine a little over a week now. My primary goal was to get it to get moving again–and I have been doing that. The lowest I have had the watch–when I charge it at night–was 13%, and that was on July 4th when I was up far longer than normal. The Apple Watch works well if you want a fitness device that does far more than a FitBit, as long as you are not interested in your sleep patterns (FitBit and Misfit track sleep). The Apple Watch really shines when it comes to motivating you to move (it really does–if you are the kind of person who buys an Apple Watch, you will also be the kind of person who wants to see all 3 bands completed), and with notifications. The Apple Maps integration is the feature that was most surprising to me. I thought I wouldn’t care, in reality, it is a nice addition. The Apple watch also shines in any situation where a quick interface works well–Apple TV, controlling audio playback, controlling a Keynote, and so on. Even the Chipotle app is perfect because it takes a saved order (assuming you like the same thing) and allows you to order it with a single press. Any time a Staples “Easy” button would work–the Apple Watch works well. And truly–Apple Pay on the watch is perfect. Press the lower button twice, pull up the card, and turn your wrist to the NFC reader–and that’s it. No phone, no card. Where the Apple Watch doesn’t do well is in situations requiring a lot of text, such as e-mail and RSS readers (and yes, there are a lot of apps with Apple Watch functionality that fit these categories). The digital crown (a nice feature–the Watch would look plain without it) does a nice job with scrolling (Sometimes I wish I had such a crown on my iPhone! ), but the screen still isn’t ideal for text-heavy applications. I would also like to be able to make the icons larger (I’m scrolling anyway), as sometimes I don’t press the right app button. I did buy one accessory for my watch other than Apple Care–the watch really didn’t charge well on its side, so I bought a Belkin Apple Watch stand. 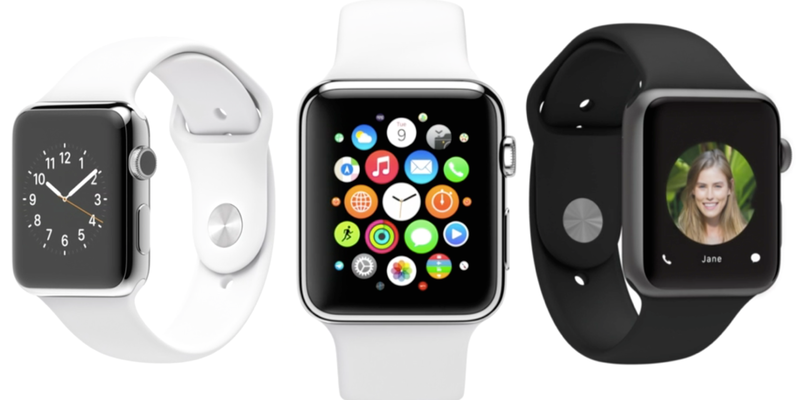 Is the Apple Watch worth it? That is up to you. I am hoping it is a catalyst for me to get back into shape, and if it does that, it would be worth its weight in gold (so far, so good). Sure, I could have bought another fitness tracker, but the ones that are out there never appealed to me–and I’m unlikely to buy a Google Wear watch as I don’t own an Android SmartPhone. I’m a week in, and my wife is already hinting at wanting one–and she used to be happy with her Misfit (it eventually fell out of its little holder and got lost) or her three month old FitBit. She’s already ready to move to an Apple Watch, so that tells you something (remember–my wife is NOT a tech geek by any means).